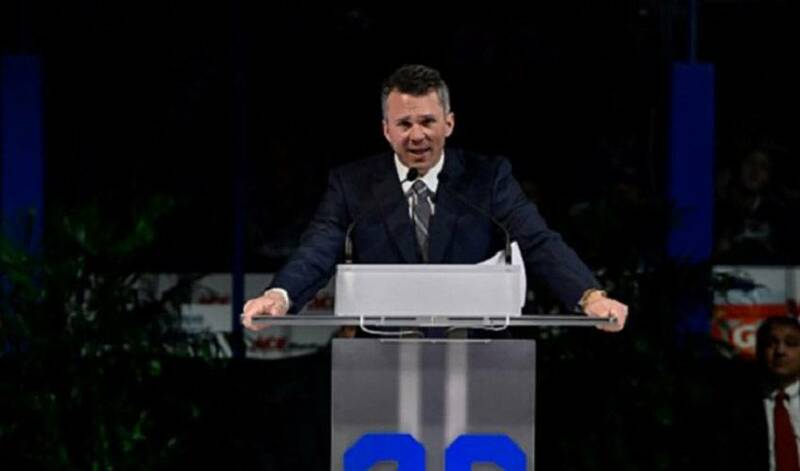 Martin St. Louis has trained his eyeballs skyward a couple of times in retirement. He watched his No. 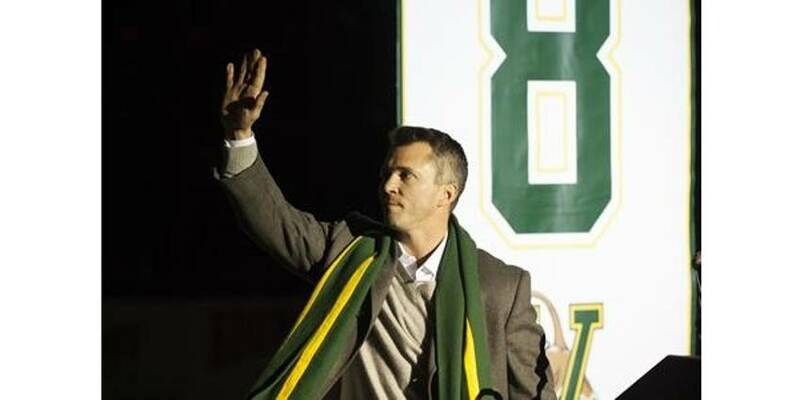 8 retired by his alma mater, the University of Vermont, at the Gutterson Fieldhouse a year ago. Then, St. Louis was feted with the similar ceremony at the Amalie Arena when the No. 26 he wore with the Tampa Bay Lightning was raised to the rafters last Friday. St. Louis shared both centre-ice ceremonies with wife Heather, sons Ryan, Mason and Lucas. The family affairs allowed St. Louis to reflect on the trajectory of his amazing hockey journey. The five-foot-eight, 175-pound right wing, after all, was supposed to be too small despite a brilliant four years at Vermont, in which he finished as the school’s all-time scoring leader with 267 points in 172 games. As a result, he went undrafted. He did earn a tryout with the Ottawa Senators in 1997 but was released. He found his way into the Calgary Flames organization, and helped their AHL affiliate in Saint John, New Brunswick advance to the 1998 Calder Cup final. But he was released a couple years later, finding a home in Tampa Bay. All St. Louis went on to accomplish was win a Stanley Cup in 2003-04, as well as the Hart Trophy and Lester B. Pearson Award, now known as the Ted Lindsay Award. He also managed to win the Art Ross Trophy in 2003-04 and again in 2012-13 at age 37 to become the oldest scoring champion in the league. What kept St. Louis going, especially early in his career? “I wasn’t ready to do anything but be a hockey player,” the 41-year-old St. Louis said this week. “It never crossed my mind to something else. If wasn’t going to be the NHL, I likely would have gone to play in Europe. The pocket-sized St. Louis was a fan favourite wherever he played because of his determination and skill level. But he angered Lightning fans back in 2014 when he requested a trade. St. Louis was upset Lightning general manager Steve Yzerman had left him off the 2014 Canadian Olympic Canadian team, but St. Louis also wanted to be closer to his family in Greenwich, Connecticut. Yzerman added St. Louis to the Canadian roster as an injury replacement for Steven Stamkos, but after the Sochi Games, in which Canada won gold, St. Louis was traded to the New York Rangers. It was a difficult time for St. Louis, who unexpectedly lost his mother France to a heart attack at age 63 in the playoffs that spring. He didn’t miss a game and his fortitude inspired the Rangers all the way to the Stanley Cup final. St. Louis played one more season with the Rangers before retiring a couple weeks after his 40th birthday. He was still productive with 21 goals and 52 points in 74 games, but he wanted to be there more for his family. “Family always has been the most important thing for me,” the Laval, Quebec native said. “You do the best you can do, but because you travel so much you can’t be there as much as you want to be. St. Louis recently started a small private equity company with some friends that invests in sports projects. But most of his time these days are spent at a rink with his hockey-playing sons, so much so that the first NHL game he attended since he retired was last week in Tampa Bay. He coaches the teams that Ryan,13, and Lucas, 11, play on while helping out at practices for eight-year-old Mason’s team. Is coaching at higher levels something St. Louis would consider down the road? But for now, St. Louis is content to watch his family grow on and off the ice. After becoming the oldest player in NHL history to win the Art Ross Trophy, Martin St. Louis has cemented his place as one of the elite offensive players in the game today.